Smart Policy Broker Portal is a broker centric insurance broker software that automates & organizes entire broker’s operation, right from Customer Quotes to Settlements i.e. settlement with customers and insurers. The solution offers ease-of-use for the brokers to fully use all the standard insurance as well as customized insurance products, giving them an advantage to expand their current business potential. 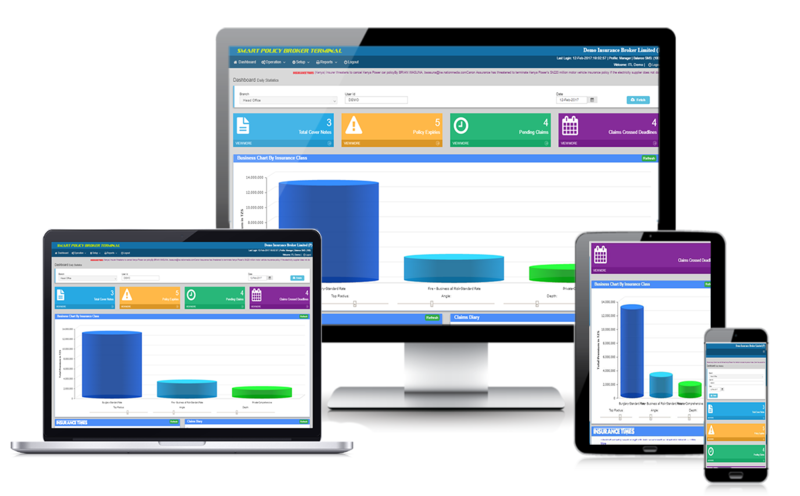 It is a insurance broker software that makes life easy for the underwriter to capture the quote only once and then prints the data on several documents such as Risk Notes, Sticker/Certificate, Debit Note and Cash Receipt. Thus avoids manual duplication of work and manual handwriting. The solution maintains the commissions rates track its receivables from the insurance companies, at the same time it manages the premium remittances to the insurance companies. By this the solution offers a huge relief to the broker in managing day-to-day operations. On the renewals system is capable of sending automated Renewal reminders over SMS & Email, further provides tracking of expired and renewed policies. System maintains end-to-end claim processes from Claim Intimation to its Settlement and closure with comprehensive reporting to track and efficient manage claims. Smart Policy is a state-of-art insurance broker software for the broker, which makes their current operation smart & effective. It’s really not easy to get in, but that’s kinda what makes it awesome. If you manage to get in, you surely know you would be working with other awesome people, as we only look for the best. Put us to work! If you are looking for digitalizing your insurance operations, we’d love to talk to you! The product belongs to belongs to Imatic Technologies Limited| Copyright © 2018 All rights reserved!